Our flotation tanks are built by Float Lab Technologies In Venice California. Float Lab has been building sensory deprivation tanks since 1999. We decided to go with these tanks for a number of different reasons. The first reason being the cleanliness of the filtration process. This process gives our customers a much better experience. Unlike other flotation tanks we do not use ANY form of chemical filtration. What is a flotation tank? Flotation tanks provide a light and sound free environment. The chamber is filled with 14 inches of water and heated to 95 degrees. There is about 1300 pounds of Epsom salt dissolved into the water. We keep the temperature at 95 degrees because that is the surface temperature of your skin. Front Room Tank (1): 4′ wide x 8′ long by 7′ high. Back Room Tank (2): 5′ wide x 8′ long by 7′ high. How is the water cleaned? After each customer, there is a cleaning cycle to cleanse the water for the next customer. This process includes two pool filters, a UV filter, and an OZONE generator. The pump runs at 1000 gallons per minute for 15 minutes. This process ensures that the flotation tanks are in pristine condition for the next customer. Float Lab’s flotation tanks are the world’s only NSF 50 & UL 1795 certified Flotation tank systems. This means they the only approved for commercial use. Before every customer, each flotation tank is sanitized by a patent pending disinfecting filtration system. This system is certified to produce a minimum 3-Log kill (99.9%) or greater per cleaning cycle without the use of any chemicals. Crash, the ower of FloatLab and main designer of the flotation tanks is regularly on mainstream podcasts like Joe Rogans, and on HBO series VICE letting people know what this therapy can do for the public and promoting the science behind it. 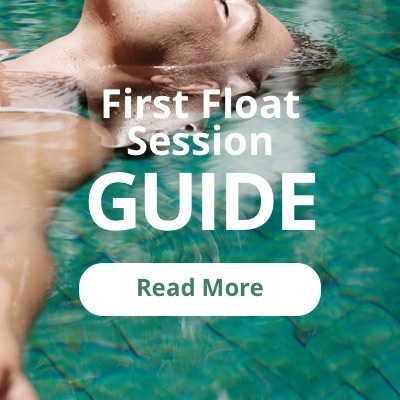 Why does a Float Lab Flotation Tank mean a better experience? Most flotation tanks are designed for individuals. These people are using their flotation tanks in the quite of their own home. However that isn’t the case in a “center” setting. At The Flo we wanted to get the best flotation tanks for our customers . When using our flotation tanks you will not experience any sensory input of any kind. Unlike other centers where you can still have that external stimuli. This creates a complete sensory deprived environment that will easily allow you to relax. This relaxation and lack of sensory input can allow your mind to experience deep relaxation. The type of deep relaxation you would experience during a deep meditative state.